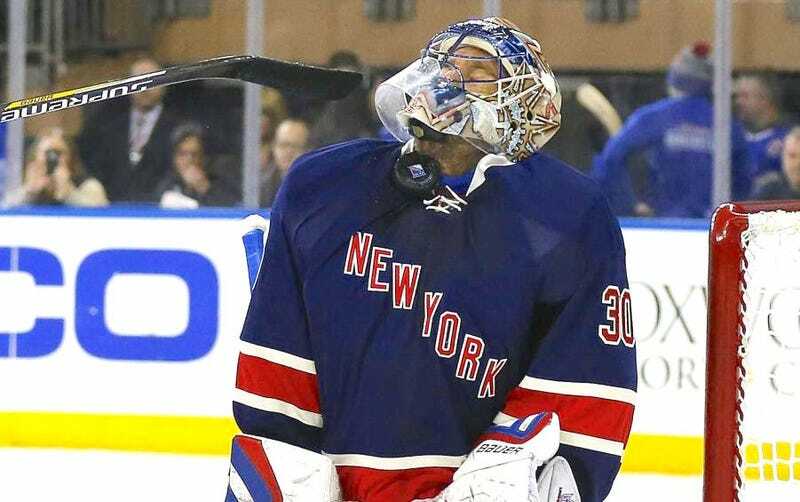 Rangers goalie Henrik Lundqvist will miss a month or more, according to the Post's Larry Brooks, after continuing to experience symptoms from taking a puck in the throat during a Jan. 31 game against Carolina. Lundqvist's specific injury is still unknown, though the Rangers appear to have an idea and a general prognosis. But the goaltender, who had been experiencing intermittent headaches, underwent a series of tests and exams on Wednesday, the results of which are known by the Rangers but have not been shared. Sources have told The Post that Lundqvist did not develop a blood clot, nor is he suffering from nerve damage or post-concussion symptoms. But whatever it is, it will require a recovery period of at least four weeks, if not longer. It's worth revisiting just how weird and fluky the incident was. The stick in the photo atop this post? That's Ryan McDonagh's, fresh off accidentally lifting Lundqvist's throat protector from his neck. The timing was perfect—Brad Malone's shot hit Lundqvist right in the throat, in the split second his throat was vulnerable. Couldn't do that again if you tried. The perfectly competent Cam Talbot will take over No. 1 duties in Lundqvist's absence. After him is 20-year-old MacKenzie Skapski, so expect the Rangers to sign a veteran.